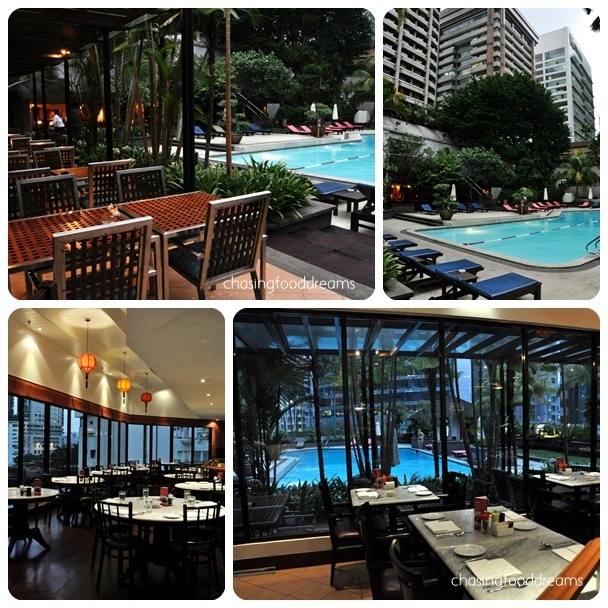 An Awesome Journey of Serving Local and International Guests at Crowne Plaza Mutiara Kuala Lumpur! There must a good reason for 40 years of great Malaysian hospitality! 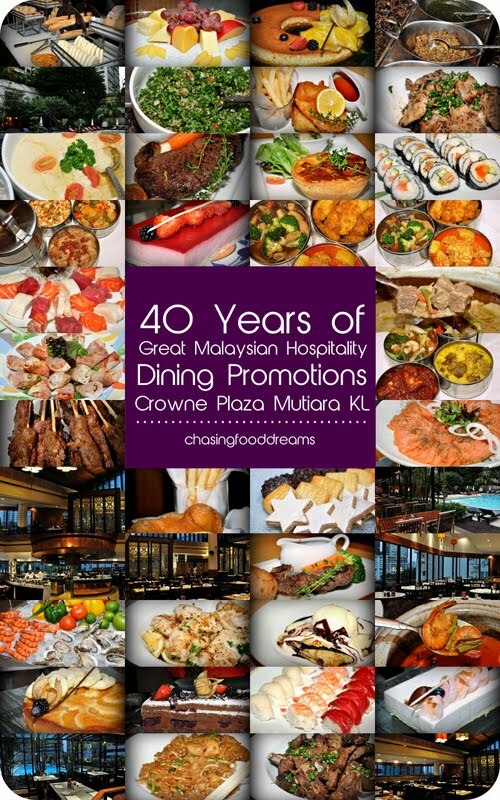 Celebrating its glorious journey, Crowne Plaza Mutiara Kuala Lumpur is proud to present several promotions in the dining scene in honor of 40 years of excellence in the hospitality industry. 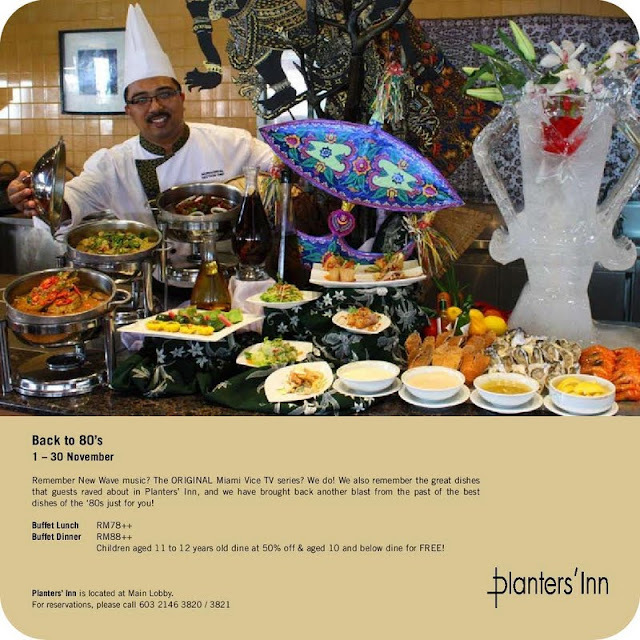 Planters’ Inn exudes pure comfort in dining with high ceilings, glorious contemporary chandeliers, a backdrop view of the hotel’s pool and the city’s view. 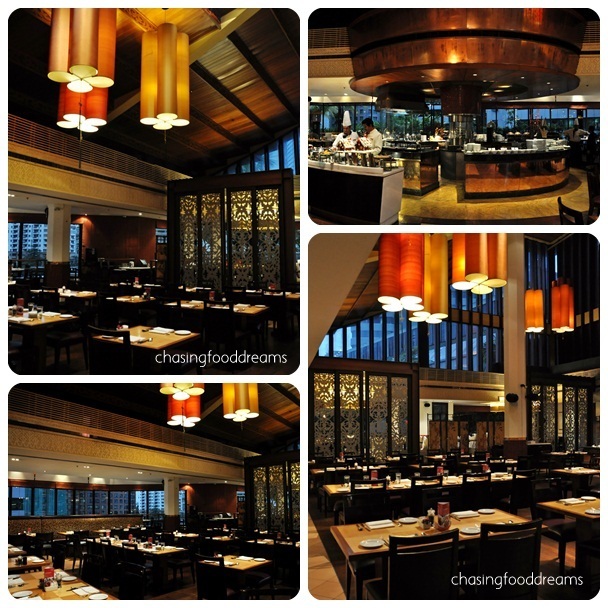 Spaciously decorated with comfort in mind, the buffet bars are also nicely spread out for diners to check out there long list of dishes! 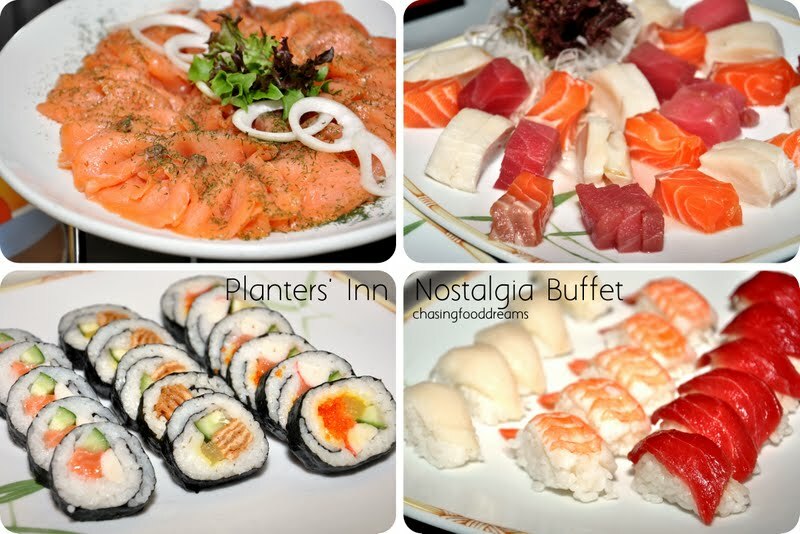 Bringing back a blast from the 80’s, check out the sumptuous array of dishes that were popular at Planters’ Inn coupled with a few of today’s must-haves! With all buffets, Planters’ Inn serves up local and international dishes with a little bit of everything for even the pickiest eater. Check out sumptuous salad bar to Japanese or hit the noodles or pasta station for some noodling. Barbeque meat is a crowd favorite while local satays are another must! Nostalgia favorites present that night are Daging Masak Kurma, Ayam Masak Merah, Udang Masak Lemak and local b salads. Seafood on Ice is always much welcome! Make sure to save room for desserts! 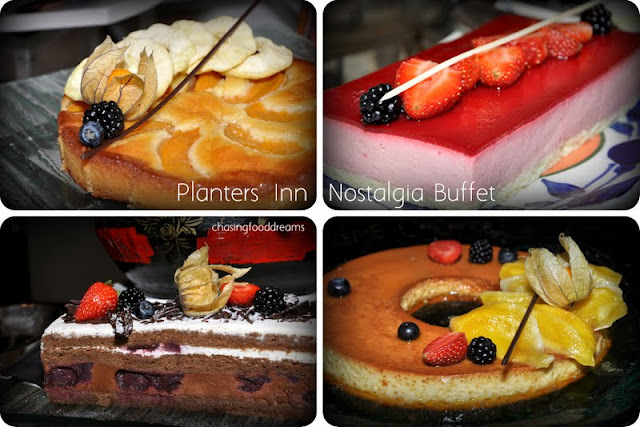 From pretty cakes to ice creams, ice kacang, and Warm Crepe with Ice Cream! For more pictures of their dishes, check out my previous post here. Too busy to linger for lunch? Check out Tiffins, located at Main Lobby, where lunch is packed in old-fashioned tiffin all ready to go to your preferred destination! 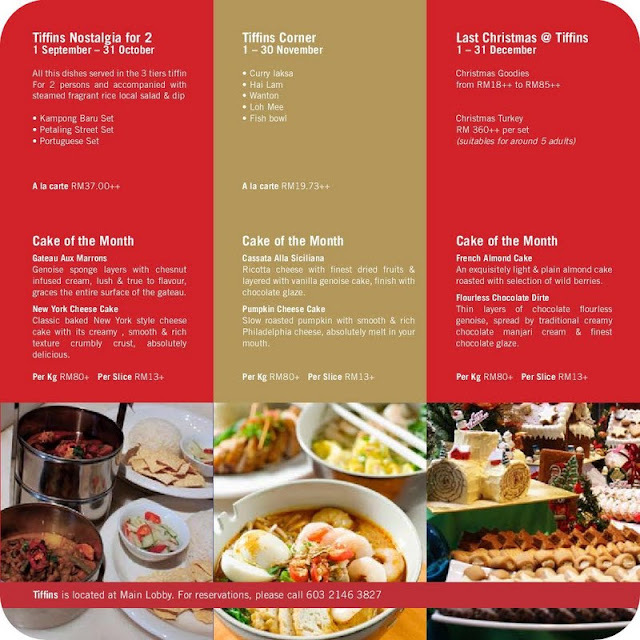 Each month features different choices of set meal. Featuring classic favorites like Fish & Chips, Pies, Steaks plus English desserts like Bread and Butter Pudding and Scones with the works! 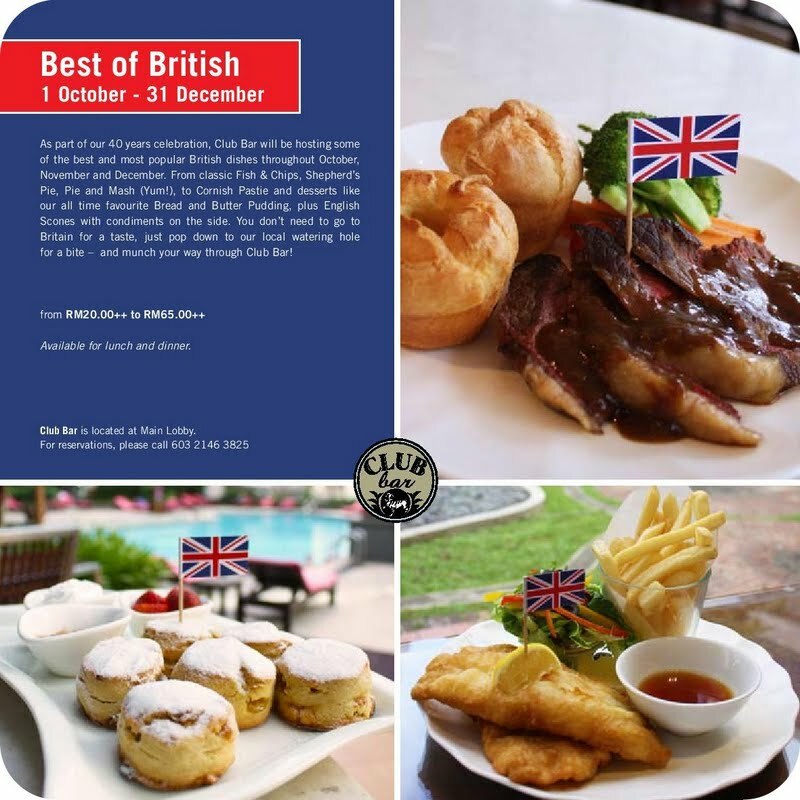 Best of British fare at Club Bar is the place to enjoy hearty comfort English fare while enjoying some sport actions and R&R moments after work. The dishes are available for lunch and dinner so grab them if you can! Crispy battered fish is served with thick cut chippies and cider vinegar… just the way the Brits like it! Savor a handsome cut steak served with traditional Yorkshire Pudding and brown gravy if you must insist on beef! Guess what? 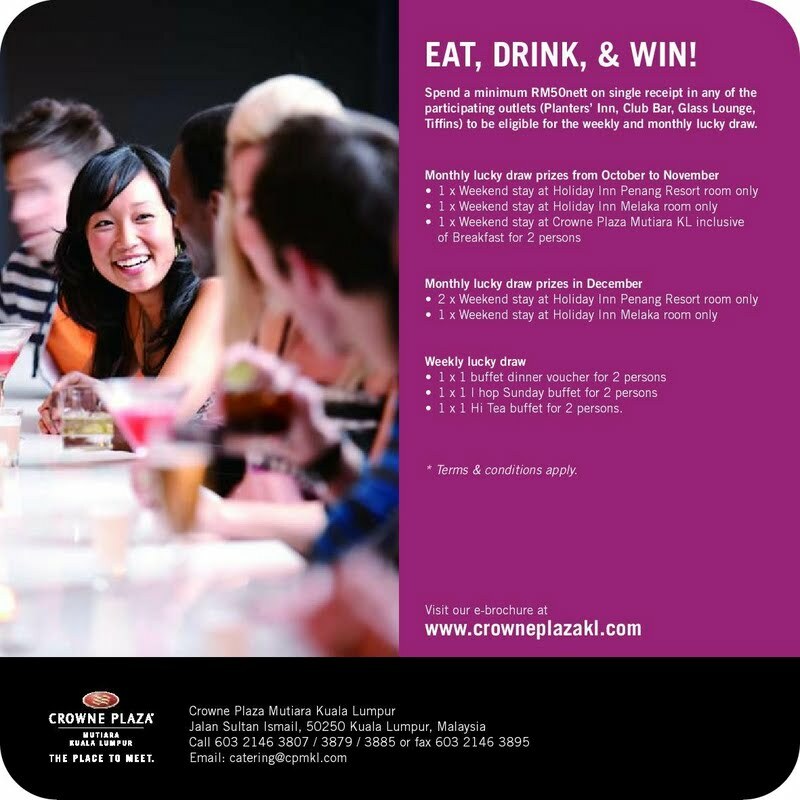 Dine at Crowne Plaza Mutiara Kuala Lumpur’s dining restaurants like Planters’ Inn, Club Bar, Tiffins and Glass Lounge and you may be the lucky winner of free dinners and even hotel stays from October to December 2012! Oooo...awesome! Love the tiffins! Any promos on the rooms? 40 years, 40% discount? Or only for guests 40 years old and above? Hehehehehe!!!! That Portuguese set looks right to me ! Oh gosh I haven't been there for years. We used to go to their Sunday bubbly brunch.